San Diego Redistricting continues to be where the real party is, with Republicans and Democrats all fighting over their independent commission’s independence or lack thereof. 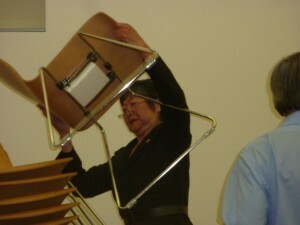 The latest controversy has to do with an Assemblywoman moving chairs (dare she!) and a progressive blog producing the most entertaining redistricting FAQ that starts with the basics then wraps it up with an attack on conservatives, and in response to a Republican critique says "Just stop it..."
Around the rest of the state, local governments are getting ready to redraw their districts in a less dramatic fashion, and State Commission watchers are preparing for the next round of hearings, April 27th – 30th in Long Beach, LA City, San Gabriel Valley and San Fernando Valley. Outside of Palmdale and Lancaster, the County of LA only grew by 1.3% - so that should be a pretty easy redraw, right?? Republicans are continuing to whine about the Citizen's Redistricting Commission that they helped create. This time it is newly elected CRP Chairman Tom Del Beccaro. Their ongoing beef: the Commission did not hire the Rose Institute to work as its technical consultants, an organization he himself describes as "Republican-leaning." If Santa Clarita City Council members Laurie Ender and Frank Ferry had their druthers, the SCV would share its legislative districts with the Antelope Valley or northern San Fernando Valley. What is Assemblywoman Yamada (D-Davis) doing in Otay Mesa on a Wednesday night? Touring the border? Offering Northern California’s help on water issues? “I was more independent than any farmer in Concord,” Henry David Thoreau once said, “for I was not anchored to a house or farm, but could follow the bent of my genius.” Pity that the folks who appointed the members of the City of San Diego’s Independent Redistricting Commission neglected to consult their Thoreau. Done right, redistricting draws out the qualities and priorities that best describe our neighbors, neighborhoods and ourselves. By drawing districts around these qualities and priorities, we indirectly define the kind of individual we wish to elect to the San Diego City Council. More than 100 people packed the Valencia Park/Malcolm X Library Tuesday night to tell a volunteer panel of seven San Diego voters how to split the city into nine evenly-populated City Council districts. Expect a big shakeup in Sacramento City Hall that will impact every member of the City Council and the people they represent. You can blame the census. Cupertino's county supervisorial district may change following California's law that requires counties to adjust boundaries based on the recently released results of the 2010 U.S. Census. El Dorado County has released five new maps showing potential realignment of supervisorial districts following the 2010 Census. If you're curious about how upcoming redistricting efforts might affect your community, the good news is you can now track all the machinations of Alameda County's effort to stencils new boundaries for its five supervisorial districts at the county's official Redistricting 2011 website. Following each decennial Census, states re-draw the boundaries of their voting districts, often to the benefit of one party over another. Some states which have lost population lose seats in the House of Representatives and some growing states gain. This highly-charged political process is taking place against a backdrop of fierce partisanship at the national and local levels at a time when sophisticated redistricting technology is widely available and when the decisions made by state governments will reverberate in the coming elections.